This yearâ€™s HMA 30th Anniversary Conference and AGM was held at the Hotel Russell in Russell Square. It was a good choice of venue being centrally located and right next to the tube station. I arrived without a hitch and was immediately welcomed by a glamorous Parm from the HMA, and the offer of a much needed tea or coffee. I received my goody bag and was pleasantly impressed by the choice of goodies on offer. I must also add that the toilets at the Hotel Russell are a huge improvement on the facilities at previous venues! The welcome speech by the Chair, Seema Malhotra, was very inspiring, including details from the HMAâ€™s recent trip to India and informing us all of the positive approach to homeopathy being taken by the Indian government. This is very encouraging news as it can all too often feel like homeopathy is only under attack. The first speaker, Dr Stephen Bourne gave a talk on GMS and EMP which gave us all something to think about. His demonstration with dowsing rods definitely caught my attention and I was especially keen to have a go at making some myself with a wire coat hanger as shown. As homeopaths we are all used to thinking about possible obstacles to cure, but GPS was something I had forgotten about and was glad to have been reminded. The mid-morning tea break with brownies was enjoyed by all as was the chance to peruse the wide range of exhibitors stalls. I bought myself a new repertory but was widely tempted by the many other things on offer. Dr Ramakrishnan started the first part of his talk on cancer treatment bringing humour to a very serious subject. I think we all appreciated his very personal story as to how he developed his approach. He is a wonderful speaker and we were all enthralled - lunch came too soon! Just before lunch there was a celebration ceremony showing how far the HMA has come in the last 30 years and awarding fellowship certificates for long standing service and commitment to homeopathy. 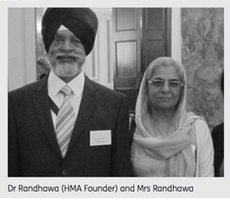 Dr Randhawa, one of the founding members of the HMA very kindly gave us a few words. Lunch was plentiful with good choices for both vegetarians and non-vegetarians alike. It was attractively laid out and inc-luded hot and cold dishes and deliciously tempting desserts. After lunch we were entertained by Dr Brian Kaplan with his light hearted talk on the case for homeopathic pyschotherapy. I definitely agree with his comment that we should have â€˜a twinkle in the eye and affection in the heartâ€™ whilst working with our patients. We were well supplied with tea and coffee throughout the day and the mini bakewell tarts that accompanied the afternoon tea break were most welcome. I was really looking forward to the second part of Dr Ramakrishnanâ€™s talk and was not disappointed. 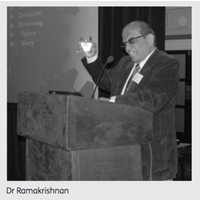 Dr Ramakrishnan was very generous and gave us details of the method he uses, the most common remedies he chooses from and on which cancers he considers likely to achieve the best results. It was an immensely useful lecture with a mass of practical information and I came away feeling more prepared in dealing with such cases. After the closing speech we were on our way feeling enlightened and optimistic about the attitudes to homeopathy around the world and armed with new approaches that could be included in our practice. Thank you HMA for a well organised conference with such relevant and practical speakers. It was just what was needed. I spoke to many delegates: members and non-members alike, and all were impressed with the speakers; the venue; the food and refreshments and above all the friendliness of everyone there. All agreed it was excellent value for money. Which left us with one question - when is the next one? "Reall enjoyed connecting with everyone. Homeopathy can be quite isolationist - will make more of an effort to come for full day." "Nice venue, bice large cups for tea." "Thank you for a lovely confernce and for all the hard work that went into it. Proud to be a member of the HMA." "Excellent day. Me colleaugue will be disappointed she didn't come. I look forward to the next event. Excellent venue (toilets good too!) Great food." Enjoyed Stephen Bourne because he highlighted effects of EM Pollution which is very important for us today. Very entertaining, clear and informative. Very dynamic, interesting aand enjoyable to listen to. Benefits of a lot of experience. Wealth of his clinical experience always fascinating to hear about.